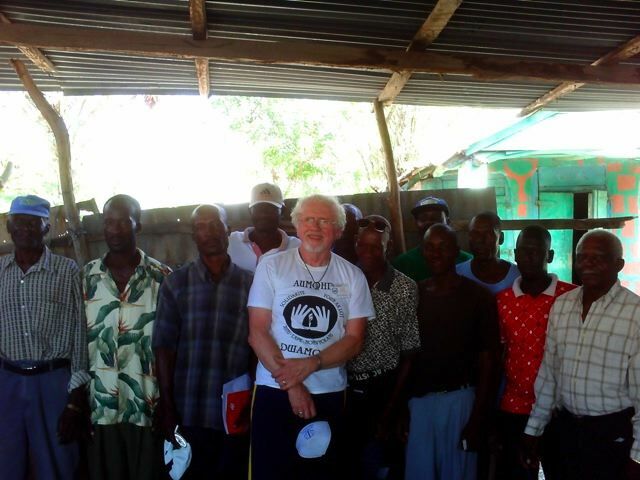 Final Entry From Relief Trip – Tom Luce | HURAH! by Tom Luce, President of Hurah, Inc.
Front yard needed to be made ready for the rains since the office was still not secure. 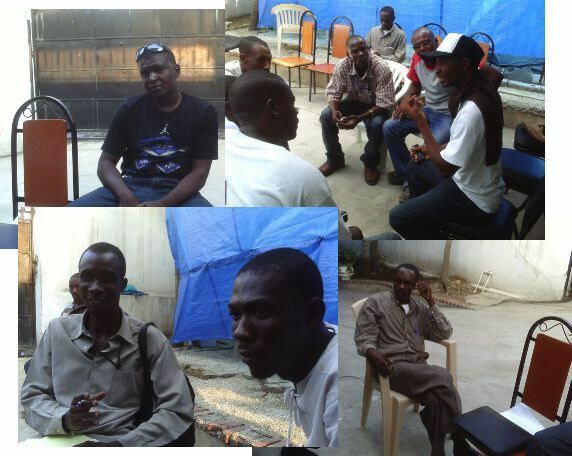 During my trip to Haiti I delivered $14,103 into the hands of our targeted quake survivor groups, the human rights defenders associated with AUMOHD. We have connected with these community leaders for 5+ years as they worked with the most poor and marginalized inner city victims of violence. Many of these leaders are victims themselves and have risen up to fight for the common good.–as followers of the non-violent, non-partisan tradition. Instead of donating to huge anonymous disaster relief programs we thought it would be more meaningful to help these leaders to get back on their feet to continue their much needed work…. Sadly our partnership with AUMOHD which had formally ended in June 09, is not expected to be renewed. Most of the money was raised since news of the quake circulated among our 71 Hurah donors (Hurah!!!! ).$6,330 purchasd a second hand Toyota pickup with larger rims and tires to handle the worsened road conditions after the quake. The AUMOHD crew used the pickup to connect with, and carry materials to, the hundreds of people needing relief supplies. $3,200 went directly to aid AUMOHD volunteers, including the four (4) Community Human Rights Councils (CHRC). These people suffered themselves, some with loss of family members, many with loss of homes, schools, businesses/work. $1600 went to help restore the AUMOHD office that has become a gathering place for neighbors and a safe haven for all labor groups in Haiti. 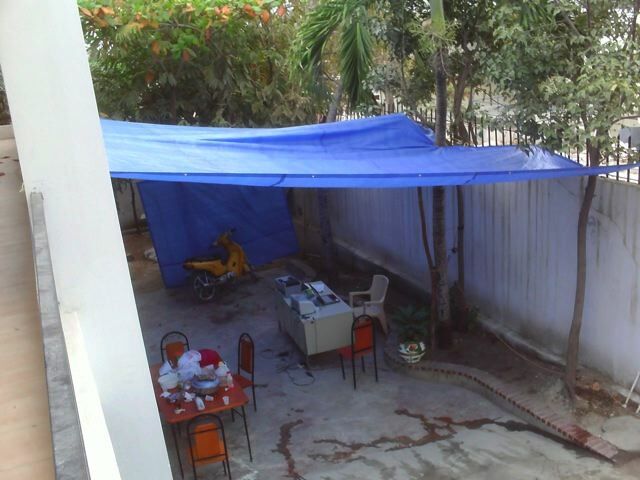 Coverings for the courtyard were purchased where office equipment, sleeping bags had to be placed and meeting space had to be made due to the dangers threatening the building.from aftershocks. Finally we provided, as requested, Tee Shirts and Caps ($353)with identifying words, AUMOHD, Human Rights, Solidarity Non-violence, Justice, Peace, Unity. We met with representatives from 3 of the inner city “Community Human Rights Councils” -CHRC, from top left clockwise, Pele Simon, Croix-des-Bouquets, AUMOHD Lawyer Atty. Toussaint, and Grand Ravin. All these courageous people have worked for years fighting for their neighbors rights, following massacres, house burnings, illegal jailings, beatings. They believe in non-violence, have the unwavering patience to stick with the politicized and lengthy process of justice. And now they are victims of the mammoth seismic blow, but still bouncing back. One important topic I wanted clarification on: would they recommend that people move to the countryside to take up a new way of living, a sustainable, green, democratic, inclusive, cooperative? The answer was a resounding yes! 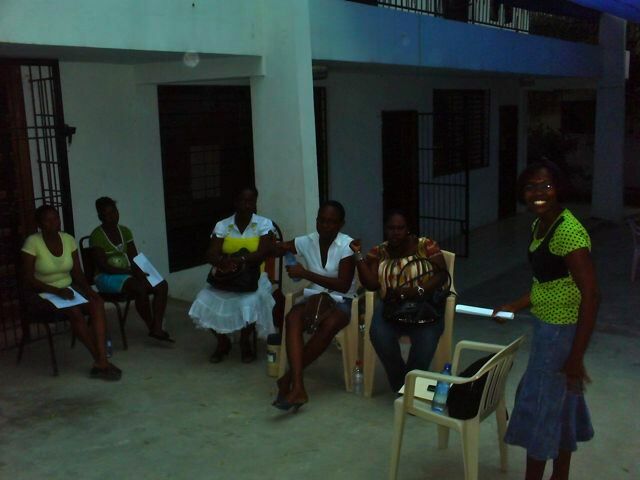 Gaëlle Celestin, Organizer of a women's group, meeting with victims of domestic abuse and exploitation as household workers. Gaëlle Celestin, far right in green shirt, is leading a women’s group in the courtyard. Gaëlle came to work with AUMOHD last year, did some reporting for Hurah and then was recruited by the Irish human rights defenders group, Frontline, to do training for leaders of women’s groups. She founded a group named GFANM (Women’s Group) which now meets at AUMOHD, domestic violence being a chief issue. Another issue for the women is the terrible labor conditions for domestic workers. Gaëlle and her family lost their home and are living at the AUMOHD office. of massacres perpetrated by anti-Aristide forces. 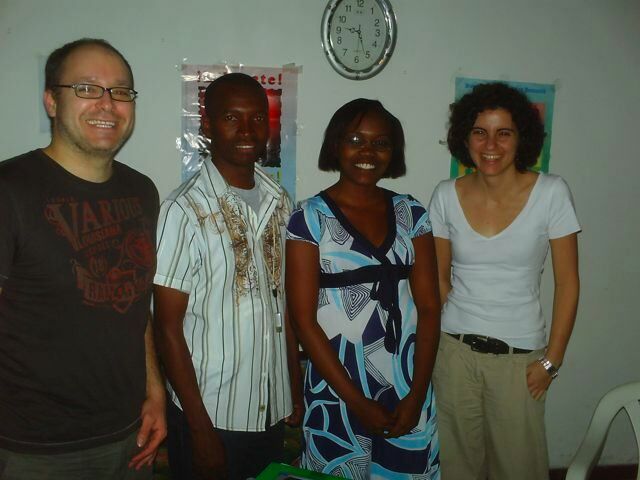 Gaëlle Celestin is third from left, now the leader of the Womens’ Group – GFanm, and another staffer from AI. Gerardo and his other AI staffer were going to spend 3 weeks doing research for AI’s report on the reaches of the quake’s damage to people and their rights, especially the women. 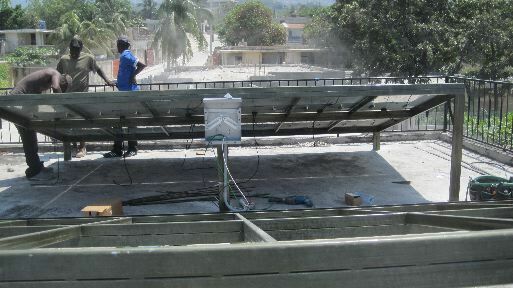 Small solar energy system donated by Hurah with two 80w panels that ran the ISP router and a couple of laptops until the quake. power a laptop! Then Namaste Solar supporter, Stephen Kane, came to our rescue and showed us how 2 80W panels with a bank of 4 batteries could run an internet router and at least one computer efficiently during the day and into the night. Because of safety concerns the system was set up at Pres. Fanfan’s house and from there our internet communications flourished. When we learned about the Hainet (an ISP) “magic box”, a little wireless router that can be carried anywhere, it could be brought to the office during the day where it was powered by the diesel generator–bought by friends of AUMOHD without ever trying to work collaboratively on a real solar system. 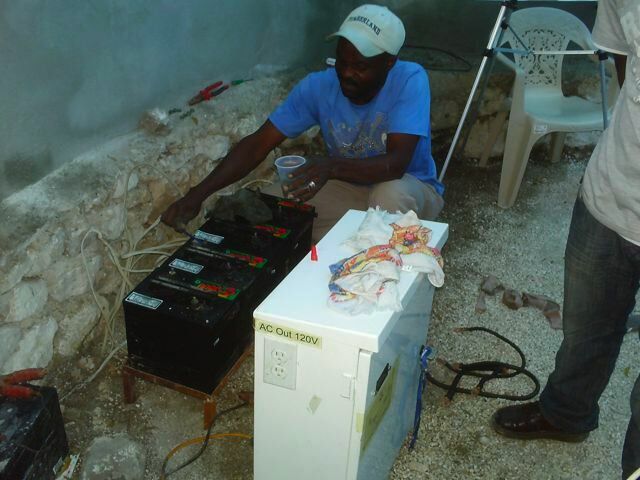 Last year Namaste gave us a new, custom built inverter and battery metal case and that worked even better. Luckily the system did not get damaged by the quake. So thanks to the folks at Matthew 25 House–site now of a 1300 person tent city– we were driven in a van to pick up the batteries and bring them to the office to be used until the new system gets installed. This house has been a guest house for people working in parish-to-parish programs for 30 years. New solar system to meet entire electrical needs of AUMOHD office incuding a refrigerator. Twelve 80w panels will power all of AUMOHD’s electrical needs thanks to Hurah’s promoting of solar power with a cooperating agency. Another great benefit from the earthquake! 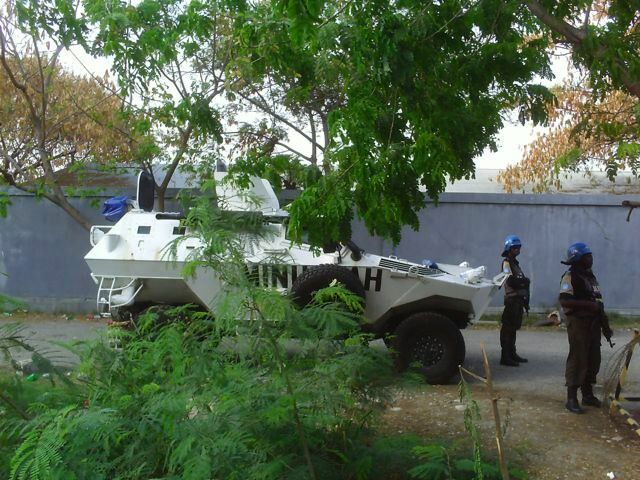 UN tank and soldiers are protecting the temporary quarters of a variety of NGO's near the airport. 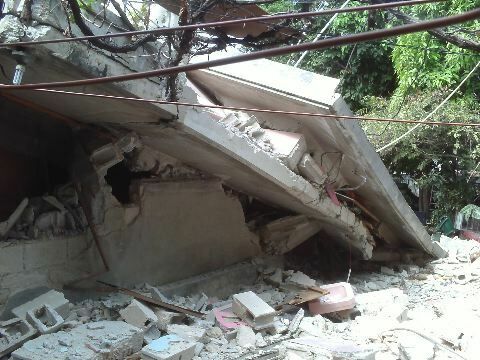 government agency was demolished by the quake, the UN itself suffered total destruction and 200 killed. UNICEF is now housed down near the airport on the land occupied by the Haitian Judiciary Police. I rode on the back of a broken down motorbike with Gentilhomme– our new trainee in communications–down the crowded streets to this office. 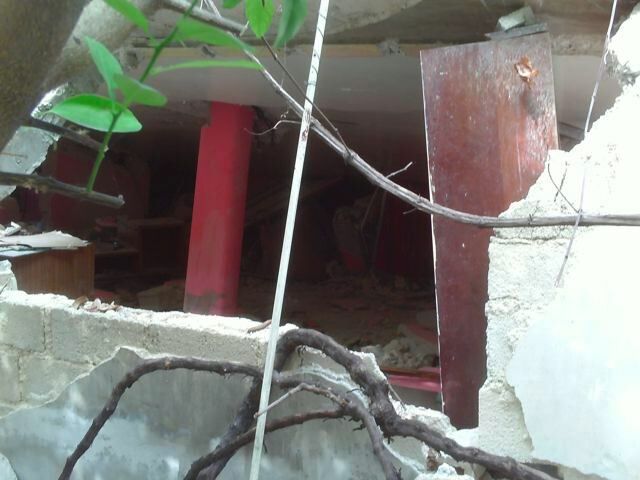 We were lobbying for getting more adequate tempoary housing for a home for boys —three houses- destroyed by the quake. This UN tank and soldiers are guarding the perimeter. Senator Moïse Jean-Charles -left- (ally since 2004), chair of the Agriculture Committee, and Senator Youri Latortue -raised hand, supporter of credit unions, in the makeshift quarters of the Haitian parliament (their new building was demolished). agricultural committee because of our support for a resettlement program that would place refugees on country land in green, cooperatively owned land. Moïses is someone I personally helped when he was being harassed up north shortly before the elections in 2006. AN IDEAL SOLUTION FOR QUAKE VICTIMS: MOVE BACK TO THE LAND HOWEVER, IT HAS NOT COME TO PASS. The day after earthquake hit we began working on long term resettlement program first entitled, “Sustainable Safety Response-SSR.” I have never worked so long, late into the early morning and up before dawn, trying to develop the rationale and the connections that this forward-looking solution to the 400,000 refugees we knew were going to appear very soon. We developed this in concert with Haitians and Haitian-Americans who sought us out because of our non-violent, non-partisan work for human rights. They wanted human rights to be central to the coop they envisioned. This long range plan became clearly something that was being left out in the early days after the quake. The plan was actually an offer by an existing land cooperative, Galette Chambon, to incorporate 15,000 refugees. With the proper backing, disaster relief agencies, financing institutions and donors this expandable model could be handled. This model was following some of the most classic Haitian solutions to social structures: cooperative, sustainable agriculture, solar powered, education for all children. And it could be replicated around the country creating a new Haiti. TOO GOOD TO BE TRUE? I DIDN’T THINK SO. SEAN PENN WAS INTERESTED! PROSPECTIVE SETTLERS INTERESTED! After receiving positive feed back from a couple of donors, including Sean Penn, who seemed to grasp the genius of the “back to the land” model –now called by us Sustainable Investment and Human Rights In Haiti SIHRH — we thought we were going to move ahead. However, our real shortcomings in terms of dealing with the logistics of managing became glaringly clear. We needed to find an alternative to the BHD, in my opinion, because we were getting nowhere with the campaign to reopen it. 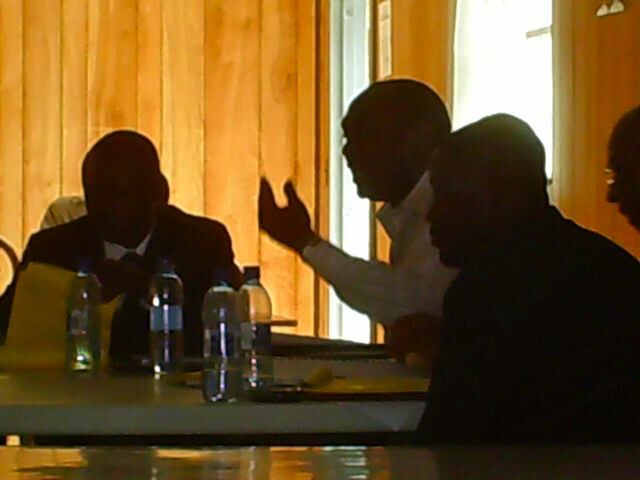 We had no staff to handle the meetings and visits on site just to get preliminaries going. And then how were the 15,000 IDP’s (Internally Displace Persons) going to be recruited and selected. I had been confronted with even progressive people with the objection that people wouldn’t want to leave their familiar surroundings, they shouldn’t have to find new ways to find a way to earn some money. That turned out to be the easiest argument to refute. When I met with our 4 CHRC (Community Human Rights Council), the very people and places affected the most by the quake, they said they would have the 15,000 people the next morning for the move. We talked about forming screening committees, working on education about the requirements for cooperative living, commitment to green living, etc. etc. It all came to a halt on March 25 when after a week of dealing with our management failures in communication, nailing down responsibilities and especially a switch in dealing with the reopening of the BHD, I became convinced that we had to slow down and solve these problems before we began setting up meetings with donors. My fellow allies couldn’t agree, so I had to withdraw my support. I felt Hurah’s integrity was at stake. I was unwilling to bring donors to our unprepared state of management and risk getting into agreements that we couldn’t fulfill. At this writing it is unclear whether anyone will keep the project going. I feel as though I’ve had someone die in the family, more though, because of the jeopardy the 15,000 people are now in of losing this opportunity. I’ve said I’m still open to working out the problems in collaboration with donors who would really understand our shortcomings. We will continue to promote solutions like SIHRH. My bedroom for 3 weeks, on gravel, not as bad as I thought. Actually I was comfortable. I slept inside the new AUMOHD office the first 3 nights of my stay, thinking that it was safe, having weathered the big quake and many aftershocks. But on night #3 there were two aftershocks in a row that shook my bed and the whole room. 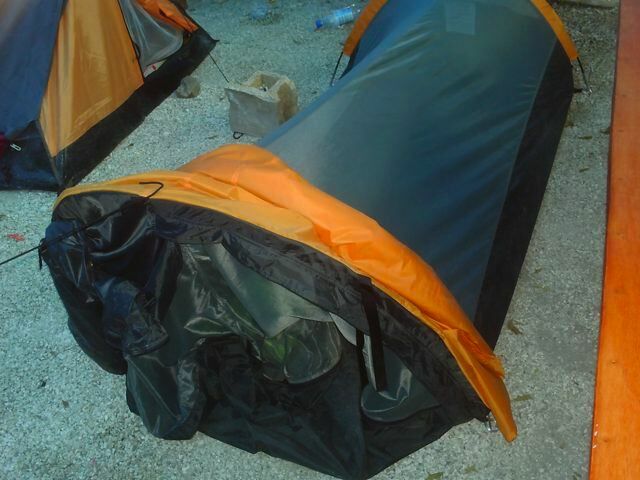 I moved out and down into the courtyard on the gravel with what turned out to be a great little solution, a one-person tent that was very nicely ventilated–as long as I had the big rain tarp covering the whole yard. A 3/4inch blow-up mattress turned out to be just fine along with an expandable pillow. I never had any aches or pains. There were probably a dozen sometimes sharing the courtyard in several larger tents. 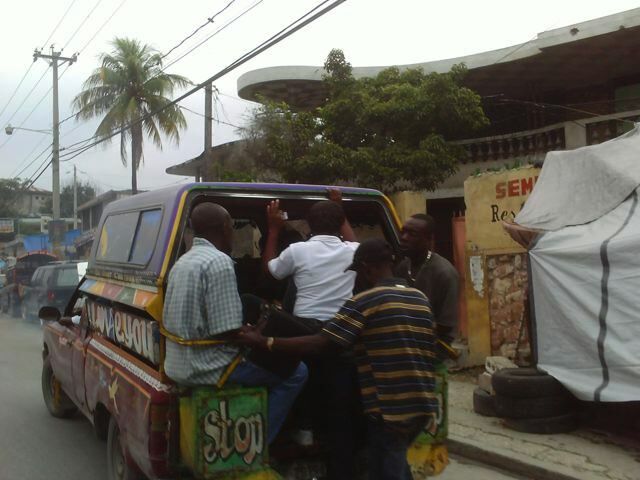 Most Haitians were not trusting the buildings at that time. I intentionally focused on what we could do to help people get back on track. 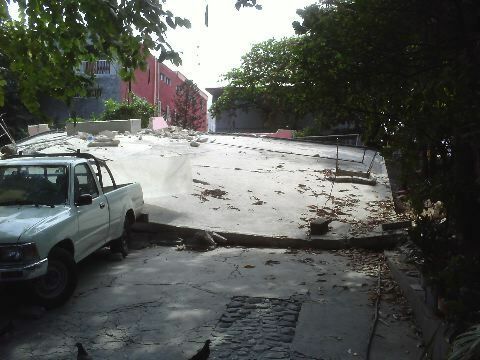 I saw a lot of devastation, but no dead bodies as was the case early after the quake. The mother of a friend of ours lived in this house pictured here completely flattened except for the rear left. Here is the rear of this elderly woman's house. And here is the reason why the woman wasn't killed. One beam held up. 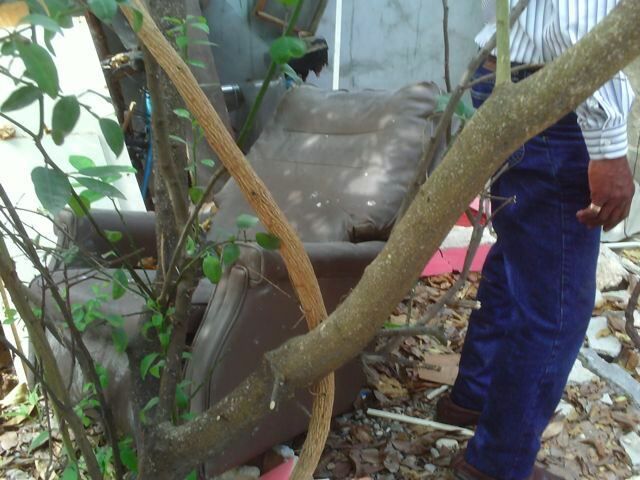 The armchair in which she was sitting and from which she was rescued. 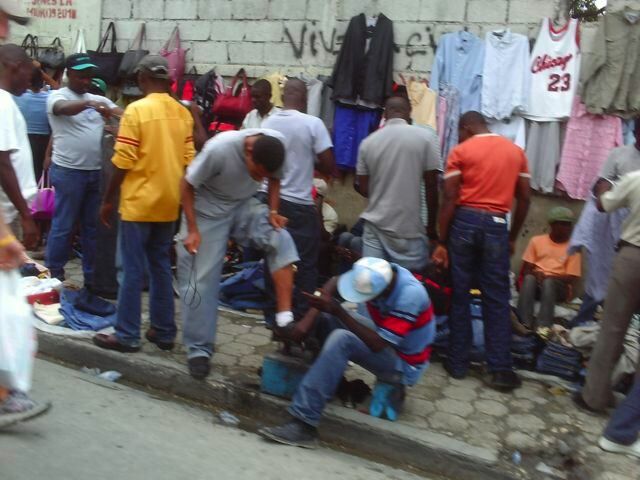 As most accurate reporters have written the Haitian people have quickly, those who are able, returned to their normal routines, selling wares in their sidewalk stalls, going shopping, to work, to the banks. Even those who are housed in tent cities have to get about and continue on. Taptaps (you tap on the drivers window to signl him to stop) are busy ferrying people up and down the huge avenue of Delmas with its ruins on every block.